Fender ’68 Custom Twin Reverb Review – A Big Jazz Amp with Bigger Tone! Traditionalists will appreciate the simplicity of the ’68 Custom Twin Reverb’s manual rotary controls – no digital screens here! These controls are located on the top strip of the amp and offer enough versatility for both vintage and custom channels. The custom channel provides standard volume, treble, middle and bass controls, along with a bright switch, while the vintage channel offers all this, as well as a reverb control (with individual speed and intensity controls). Of course, as you probably expect from a high-end Fender amp, the controls are robust and responsive. No flaws here either! The design and build of the ’68 Custom Twin Reverb are unmistakably Fender and nothing should surprise you in this department. It remains very similar to the original, with Fender’s classic ‘Silverface’ look from the late 60s along with the tailed Fender badge in the top left corner. However, the addition of the turquoise-tinted front panel is very eye-catching and a nice touch, as is the silver-turquoise grille cloth with aluminum trim. Under the hood, this amp justifies its higher-end price tag, with exceptional components. These include hand-wired 6L6 power tubes (four of them) and six preamp tubes, all hooked up to vintage-spec Schumacher transformers and two 12” Celestion G12V-70 speakers to offer a huge 85 watts of power. Meanwhile, this amp incorporates a built-in ‘kick stand’ to angle it back towards you, as well as a handy two-button footswitch and a dustcover. With this in mind, you can clearly see this amp is built for stage performance. If we only had one word to describe the sound of this amp it would be ‘clean’! Thankfully we have more words, so we can explain how crystal clear it actually is. This is one of the reasons it is so popular with jazz guitarists, as it offers that creamy tube warmth at a high volume without breaking up too early. With 85 watts of power, there’s a lot of headroom and volume on offer, with this amp easily breaking through any mix – it’s a bit of a beast! The vintage channel offers the more traditional warm tube tone with great definition, capturing the dynamics of your playing very well, while the custom channel provides a ‘modified Bassman tone stack’, which takes pedals with ease. At over $1,000, the ’68 Custom Twin Reverb won’t suit everyone and it will be too powerful for most jazz players wanting a day-to-day amp. However, for gigging musicians and particularly serious jazz guitarists who want to capture every nuance of their playing with warmth and clarity, this is an exceptional choice. 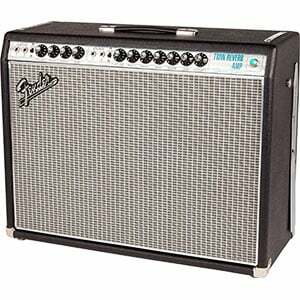 For more info about the Fender ’68 Custom Twin Reverb, click here.